The best and most sought-after shexian inkstones are said to come from Longwei (Dragon-tail) Mountain in Anhui, Eastern China. 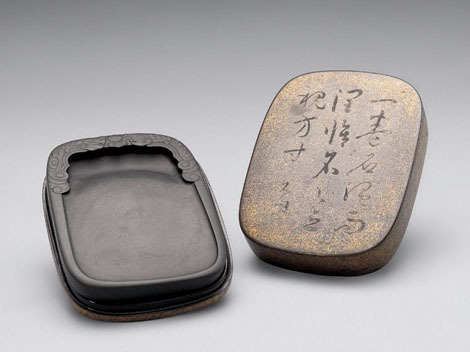 A stone inkstone was found in a 5,000-year-old archeological site in Jiazhai of Shanxi Province, a tradition much older than Japan’s. Above Duan inkstone with relief carving of kui dragon grasping suns. In the sixteenth century of our era a Japanese author1 spoke of an old (certainly Chinese) tradition, according to which a dragon’s fetus lives during a thousand years in the sea, for a thousand years in the mountains and, after having been among men (“in a village”, says the text) for the same long period, it finally is born, becomes a dragon and ascends to the sky2. During these three thousand years the fetus lives as a very small snake within astone, the dragon’s egg, which is first lying at the bottom of the sea, then comes to the mountains (how it got there is not explained), where after a thousand years it is picked up by somebody who carries it home and preserves it on account of its beautiful colours, or uses it as an ink-stone (suzuri, 硯 ). 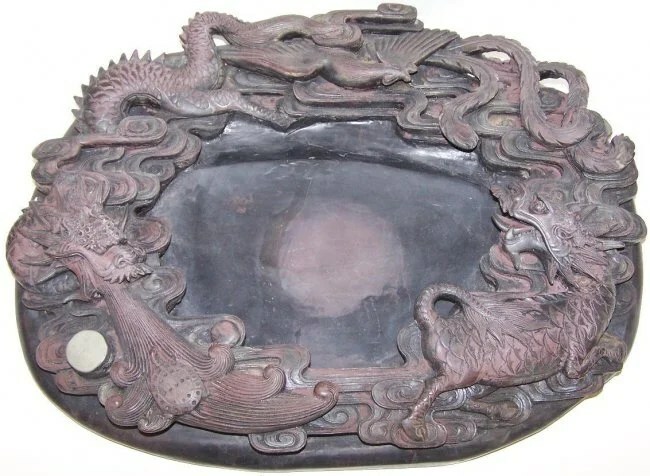 As it invariably has the remarkable peculiarity of constantly producing water (the dragon’s element), it is a very convenient ink-stone indeed3. But woe him who possess such a stone at the end of the millennial period which the fetus must pass among mankind, for then the stone splits, and a small snake creeps out of it, which in a few moments becomes larger and larger, and with a terrible noise forces its way to the sky, smashing the roof amid thunder and lightning, and ascending in a dark cloud. The little reptile has become an enormous four-legged dragon, which leaves the narrow abodes of men and frees himself in this terrific way. A remarkable ink-stone was preserved in olden times, says the Kii zodanshu1, in a Zen monastery at Kanagawa, Musashi province. Drops of water were constantly dripping out of this stone, but nobody understood the reason of this strange phenomenon. Once upon a time, on a very hot summer day, when the monks were sitting together in a cool room, all of a sudden the ink-stone split of its own accord, and a small worm, about to kill the beast, but the head-priest forbade them to do so, and carefully carried it on a fan to the garden, where he put it into the lotus pond. All the monks followed him, and while they were looking at the worm, they saw with astonishment how the little creature, drawing together and stretching its body, grew larger and larger. In a great fright they ran back into the house, but even there they soon felt themselves no longer safe, for the sky, hitherto quite clear, at once was covered with clouds, thunder and lightning raged, and a pitch-black darkness filled the garden and enwrapped the building. Then they all fled away through the gate and saw from far how the dragon in an immense cloud ascended to the sky, first his head, then his four-legged body, and finally his enormous tail. When he had disappeared, the clouds dispersed and the sky became clear as before. The garden, the pond and the building, however, were all in a terrible condition. In the mean time people from the neighbouring villages came to the rescue, thinking that the monastery was on fire. A writer of the eighteenth century, KIUCHI SEKITEI2, relates the same accident as having happened in Kanazawa (instead of Kangawa). Furthter, he mentions a round stone which was picked up by a boy in the mountains near Sammon, in Omi province. As water was constantly trickling out of this stone, the boy used it in later years to wet his ink-slab. After fifty years, when he had attained the rank of Archbishop — the stone apparently had brought him propsertiy — the curious object split and a dragon arose to the sky, after breaking through the ceiling and the roof. The stone existed still in SEKITEI’s time, and in the middle of it there was a hole of the size of a bean. p. 217 A similar dragon’s egg was used by a Buddhist priest in Moriyama, Omi province, 1774, for grinding his tea, till the dragon was born and ascended, leaving a round hole in the middle of the stone1. In another case such an egg was recognized before by a great scholar, thoroughly versed in Chinese literature, the famous Iro JINSAI2, who warned a Court-noble, telling him that a magnificent stone, square and five-coloured, in the nobleman’s possession was a dragon’s egg, and that he had better throw it away in some lonely spot. The man followed the scholar’s advice, and built a little Sinto shrine in the open field outside the capital in which he placed the stone. A few years afterwards the shrine was smashed by the dragon which ascended to heaven, This stone was a so-called ryusho-seki, 龍生石, or Dragon producing stone”3. The name of “dragon-horse-stone” (ryu-me-seki,龍馬石)was given to another remarkable stone, white as crystal and as big as the palm of the hand, which was lying on the desk of a samurai in Hizen province. In its centre a moving creature was visible, and the stone moved by itself from one side of the desk to the other. One day the man placed a tea cup filled with water on the desk, and when he came back the up was empty. The next day he made the same experiment with a big bowl, and while he was talking with some friends in the next room, they heard a noise as of wind and waves. At once they went to look what the matter was, and discovered a lizard (tokage, 石龍子, litt. “little stone-dragon”) running from the bowl to the stone, which it entered4. Two “snake-producing stones” (sho-ja-seki, 生蛇石 )5 were found in a hole at Kyoto in 1752, and in 1780 a “golden snake stone” ( 金蛇石) was picked up in the mountains by a child. Water was constantly flowing out of it, till it was cooked and the dragon inside it was killed. Then it was split and the dead body of a little gold-coloured snake was found in it6. Although they were not dragon’s eggs, we may mention here two stones which were believed to be connected with dragons. One of them was a big stone lying in a hollow excavated by a waterfall near Kayao village, Inukami district, Omi province, which was said to belong to the Dragon-god of the place and was called the Dragon-god-stone” (龍神石, Ryujin-seki) by the villagers. In the kyoho era (1716-1735) five or six men came to the neighboring villages and asked the inhabitants to sell them women’s hair in order to make rope by means of which they might carry the stone as an offering to the Dragon-god of Seta, A short time afterwards the stone actually disappeared but it was much too heavy to have been carried away by human hands (probably the men in question were transformed dragons), The second stone, which was black and about three shaku long, lay in a garden and was said to cause even a clear summer sky to become cloud in a moment, when it was touched by somebody. In 1764 the stone was no longer outside but within the castle, so that the experiment could not be made anymore. “Perhaps”, says HOTTA, the author of the Sanshu kidan, ‘it is a so-called “cloud-root’ ( 雲根 un-kon)”2. p. 237 “The large number of names of Buddhist temples and priests, connected with the Indian dragon, showed the important part played by the Naga in Japanese Buddhism.